Asarum, also know as wild ginger, are a deer-resistant woodland perennial. They perform well in moist but well-drained soils. Many are evergreen and will slowly form a dense groundcover. Below is a selection of our North American native Asarum arifolium selected by Plant Delights in 2006 and introduced in 2015. Asarum flowers are almost alien-like and are born at ground level in late winter. We have many new selections of asarum available this year, so check us out online when you are ready to add wild gingers to your woodland garden. Fall is a great time for gardening. With cooler weather there is less transpiration and water stress on the plants. Also, even though the top of the plant may be dormant, the roots are still growing. This gives the plants a chance to establish a good foundation over the winter and a head-start going into spring. Speaking of a good foundation, a healthy garden starts with good soil preparation. Soil care is essential in avoiding plant stress and subsequent pest problems. Join us next Saturday, November 12 from 10-noon for an interactive lecture that will cover nutrient balance, soil test reports, how to incorporate organics, taking care of microbes, and an array of misconceptions regarding planting techniques. If you have soil test reports, be sure to bring them with you. Cypripedium, Lady Slipper Orchids, is a genus of woodland garden plants that are among the most desired of all native hardy orchids for sale, despite their often finicky requirements. Plant Delights Nursery is excited about our bare root shipment of responsibly grown, flowering size, cypripedium orchids we received yesterday. These plants are nursery propagated and not collected from the wild. Fall is the best time for planting your hardy lady slipper orchid. Beds should be well-prepared and amended with compost unless you naturally have rich, organic soil. Dig a shallow but wide crater, spread the roots out flat (with eyes pointed upward), cover them with 1" of soil, and water in well. You should avoid planting your lady slipper orchid near aggressive groundcovers (such as ivy, vinca or Japanese pachysandra) or near the base of trees or large shrubs due to root competition. Check out this article on Cypripediums for more in depth information. Exploring the Wonders of Fall! Today is the first day of our Fall Open Nursery and Garden. We will be open til 5pm today, 8 am -5 pm tomorrow, and 1 pm - 5 pm on Sunday. Don't fret if you can't make it this weekend, we will also be open next weekend, September 16 - 18. Come explore the gardens in their full fall glory and get inspiration for your own garden. Our sales houses are stocked full or rare and unique perennials to excite even the most seasoned gardeners. We are adding plants to the sales houses throughout open house, and many in limited quantities. Here is a teaser of items we added just today: Verbena 'Lavender Frappe' and Aspidistra 'Leopard'. During your visit, be sure to stop by our grape arbor and sample many varieties of muscadine grapes (Vitis rotundifolia) such as Farrer, Janebelle, Sweet Jenny and Ison. Muscadines can have bronze or purple hulls, ripen in the fall and are native to the Southeastern US. Which is your favorite? Here's Baptisia 'Cherries Jubilee' in the garden...a unique butterscotch and brown flower...a Hans Hansen hybrid. 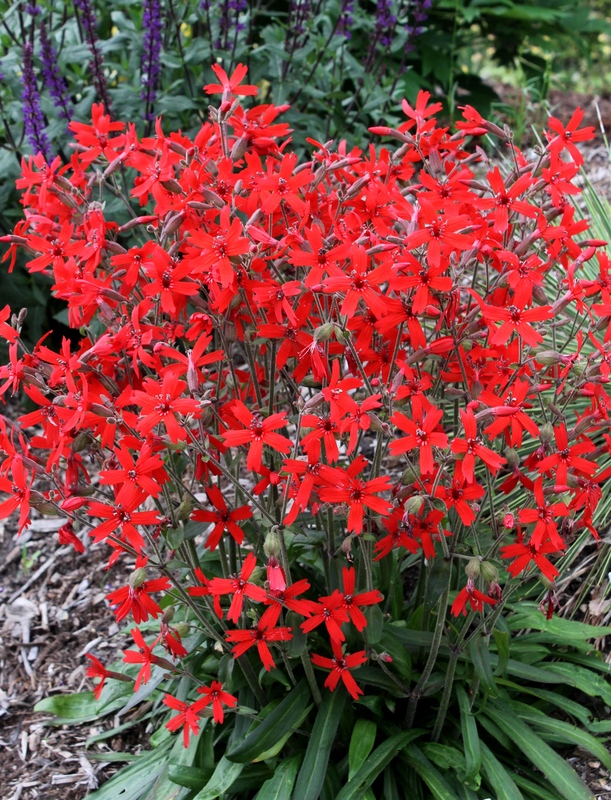 Silene ‘Jackson Valentine‘ is one of those plants you just can’t help but photograph. In fact, I seem to wind up taking a new picture each day during its spring flowering season. Here it is in the garden yesterday in all it’s radiance. This incredible native thrives in part sun with good drainage. It just doesn’t get much better than this.